Johann Strauss, Vienna's greatest composer of light music, was known for his waltzes (dances) and operettas (light operas with songs and dances). His music seems to capture the height of elegance and refinement of the Hapsburg regime. 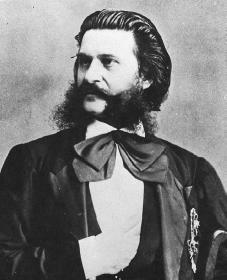 Johann Strauss Jr. was born on October 25, 1825, in Vienna, Austria. He was the eldest son of Johann Strauss Sr., a famous composer and conductor, known as "the father of the waltz." Although the elder Strauss wanted his sons to pursue business careers, the musical talents of Johann, Jr., quickly became evident, as he composed his first waltz at the age of six. Strauss's mother secretly encouraged the musical education of her son behind his father's back. She arranged for one of the members of the father's orchestra to give the younger Johann lessons without his father's knowledge. When his father left the family in 1940, Strauss was relieved, for it meant that he could freely pursue his music without secrecy. At the age of nineteen he organized his own small orchestra, which performed some of his compositions in a restaurant in Hietzing. When his father died in 1849, Strauss combined his band with his father's and became the leader. He ultimately earned his own nickname, "the king of the waltz," or "the waltz king." balls in Vienna from 1863 to 1870. During this time he composed his most famous waltzes, including On the Beautiful Blue Danube (1867), probably the best-known waltz ever written, Artist's Life (1867), Tales from the Vienna Woods (1868), and Wine, Women, and Song (1869). In 1863 Jacques Offenbach (1819–1880), Paris's most popular composer of light operas, visited Vienna. The two composers met. The success of Offenbach's stage works encouraged Strauss to try writing operettas. He resigned as court conductor in 1870 to devote himself to this pursuit. Three operettas are consistently popular and available for performance today. The finest of them, Die Fledermaus (1874; The Bat ), is probably one of the greatest operettas ever written and a masterpiece of its kind. The lovely Du und Du waltz is made up of excerpts from this work. His two other most successful operettas were A Night in Venice (1883), from which he derived the music for the Lagoon Waltz, and The Gypsy Baron (1885), from which stems the Treasure Waltz. Strauss continued to compose dance music, including the famous waltzes Roses from the South (1880) and Voices of Spring (1883). This last work, most often heard today as a purely instrumental composition, was originally conceived with a soprano solo as the composer's only independent vocal waltz. Strauss wrote more than 150 waltzes, one hundred polkas, seventy quadrilles (square dances), mazurkas (folk dances from Poland), marches, and galops (French dances). His music combines considerable melodic invention, tremendous energy and brilliance with suavity and polish, and even at times an incredibly refined sensuality. He refined the waltz and raised it from its beginnings in the common beer halls and restaurants to a permanent place in aristocratic (having to do with the upper-class) ballrooms. Crittendon, Camille. Johann Strauss and Vienna: Operetta and the Politics of Popular Culture. New York: Cambridge University Press, 2000. Ewen, David. Tales from the Vienna Woods: The Story of Johann Strauss. New York: H. Holt and Company, 1944. Gartenberg, Egon. Johann Strauss: The End of an Era. University Park: Pennsylvania State University Press, 1974. Jacob, Heinrich E. Johann Strauss, Father and Son: A Century of Light Music. New York: Greystone Press, 1940. In paragraph 3 the article says "when his father left the family in 1940" the father died in 1849 . Could this error be corrected ?